Ask any salesman which is the best type of RV to buy, Class A or Class C, and most will say Class A. Of course, they are bound to say that as Class A RVs will normally cost much more and it’s all about the commission. And with the RV industry shipments expected to top 20 billion dollars in 2018, that’s a lot of commission. 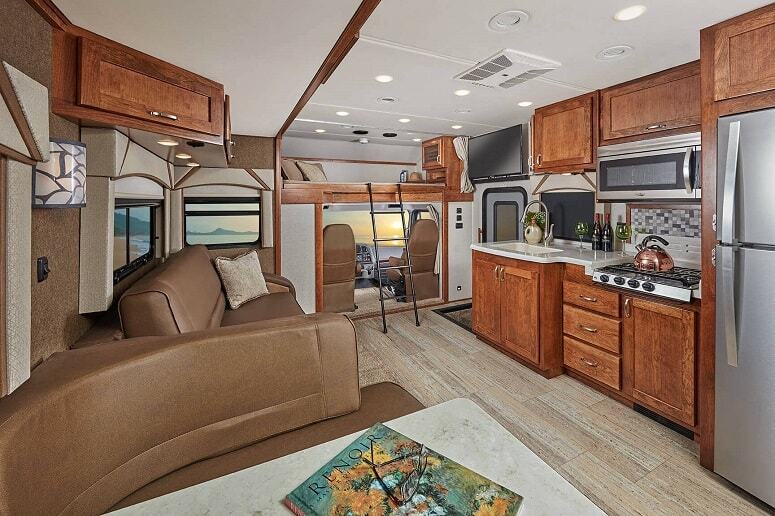 If you’re tempted by the cheaper price of a Class C RV, bear in mind one day you are likely to trade it in for a luxury Class A.
It’s very rare that anybody ever trades in their luxury motorhome for a smaller, “cab” style, RV—or so the same salesman told me! Let’s take a look at some of the reasons why I’m cutting out that middle step and choosing a Class A RV (and not a Class C). I’ll start with the obvious reason to choose a Class A RV. The size of an RV is a major consideration when choosing any motorhome. Remember, it will be your home when you’re on the road. It’s like the choice between a four-bedroom house or a two-bedroom apartment. Class A RVs are known to be some of the largest motorhomes on the road, and can reach up to 50 feet in length. That said, the average length of a Class A tends to be about 35 feet, because many national parks have a 40-foot limit for RVs. By comparison, the longest Class C is only 33 feet long, with most being around the 25 to 27 feet mark. Try fitting a washer dryer into a Class C RV and you will soon appreciate that extra 10 feet. The following video shows some of the luxuries you can enjoy with the largest of Class A RVs. With all that extra space in a box-like design, most manufacturers offer multiple floor plans for you to choose from. Winnebago tends to offer a choice of three floorplans with their larger Class A RVs, and a full range of customizable extras. Many even feature one or two slide-outs, for even more floor space. When looking for luxury, you will find it hard to beat a Class A RV. Class C RVs often seem cramped in comparison. With most Class A motorhomes, four to five people can sleep comfortably, and even stretch out like they’re in the front room of the family home. The extra height of a Class A RV makes them ideal for installing bunk beds for the kids, in addition to a full-size bed for mommy and daddy. Dinettes can be easily flattened down for more beds, and there’s enough floor space for fold-out sofa beds. There’s even more space available for cots for younger children, or a dog bed for your beloved pets, in a Class A RV. For many people, myself included, the kitchen is the heart of a home, even when you’re on wheels. Due to the larger size of the Class A RVs, there will be more space for features like dish drawers and full-size household appliances. With additional counter space and more storage, Class A RV kitchens will be more functional than many of their counterparts. Brands such as Entegra Coach include kitchens which are spacious and cleverly designed. The CornerStone range features a convenient dishwasher, induction cooking top, convection microwave oven, and a residential-sized refrigerator with an ice maker as standard. One of the most annoying aspects of RVing can be storing everything in your valuable living quarters. Although your RV may have plenty of cupboards and under-bed storage, you will be surprised by how quickly they fill up. There’s no comparison when talking about the storage facilities of Class A versus Class C, including more underfloor features. Underfloor, or underbelly, storage can either be accessed through side doors (like on a traditional coach) or from above. Items such as kayaks or other sports equipment, which you don’t need access to every day, can be easily stored in compartments under the floor. A Class C RV will be too low to the ground to offer the same underbelly storage options. The underbelly storage space can also be used for the larger water tanks you will need with extra people living in the RV. 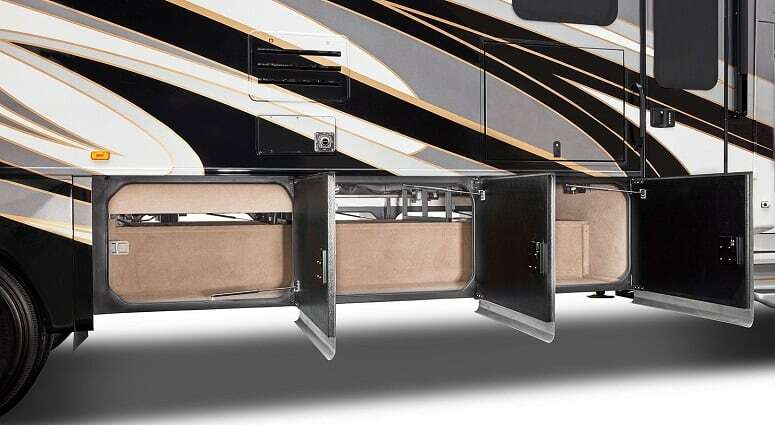 Most Class A RVs designed for all-year usage will feature some form of heated and insulated underbelly, to prevent pipes from bursting. Many Class C RVs have their pipes and dump valves extending openly below the body of the RV. This means that the pipes are prone to freezing. Class A RVs use some of the most powerful engines you will find in an RV—and they need to, with all that extra size and weight. Remember, many Class A RVs will use a coach chassis and/or engine which may have been designed for powering a coach with up to 70 people on board. Class A RVs, especially diesel motorhomes, offer more push for getting through those steep mountain passes. Powerful engines, like the Cummins ISL turbocharged 450 hp engine found on the Entegra Aspire range, provide better towing capacities than Class C RVs. 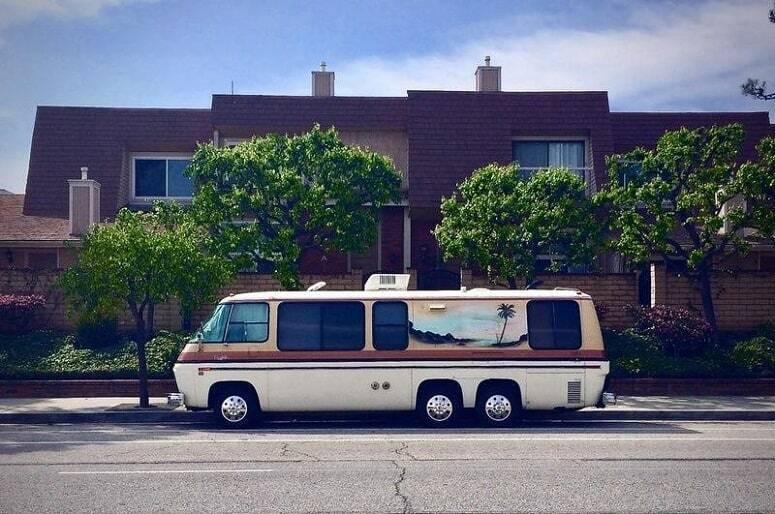 You could easily tow a boat or a horse box with a Class A RV. As many would argue, it’s not always about how long something is, but how you use it. Despite usually being 35 feet and over, you can also get shorter Class A RVs. Some are even as short as 21 feet. Even with a shorter Class A RV, you will get more space than a Class C, due to no living space being wasted by the driver’s cab. In a Class C, the front driver’s chair and passenger seats will be divided from the living space with some form of an interior wall. This means that about 7 foot of your vehicle’s length is not accessible when parked up. Compare that with a Class A driving cab, where the seats are actually in the living area. When you set up camp, you simply rotate the seats to expand your seating space. 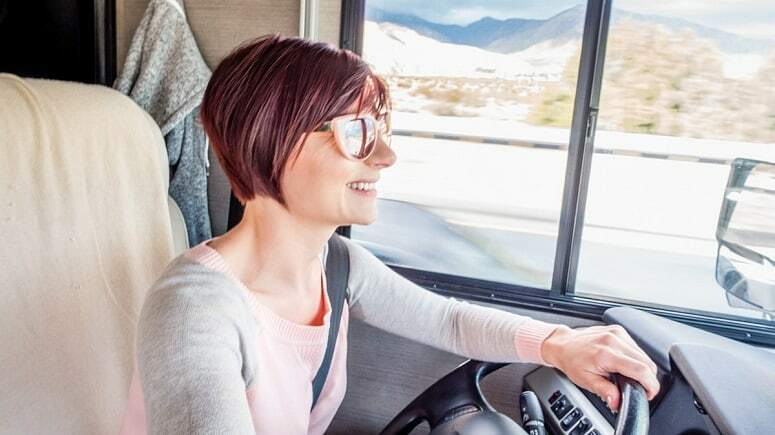 Ideal for those unexpected gatherings, when extra seating comes in handy—try doing that in a Class C.
One of the most annoying parts of driving a Class C RV, in my opinion, is the restricted vision it offers. With Class C RVs being lower to the ground and the cabin on top of the driving space, your view of the road ahead can be restricted. The body of a Class C is also wider than the driver’s cab, meaning you can’t easily see what’s behind you either. The experience of driving a Class C RV is akin to driving through a very long tunnel. I often find the restricted space can feel quite squishy as you drive, and you feel alienated from fellow passengers. Large, panoramic windshields give you an unobstructed view of the road ahead. Being so huge, the front windshield also gives riders in the back a great view of the road ahead. With Class A RVs being a uniform width from front to back, you also get a clearer view of the road behind than with Class C RVs. What’s the point of all that extra comfort and luxury if you feel like you are off-roading every time you crank up your RV? Class A RVs are known to offer a smoother ride, similar to the experience of a city bus. Compare this with a Class C trip, which is more like riding in a Uhaul, which basically is what a Class C RV is. Many Class A RVs will feature extra shock absorbers and heavy-duty stabilizer bars at both the front and rear. One brand, Jayco, even features a unique JRide Plus driving system, which also incorporates a computer balanced drive shaft. These extra features help to eliminate any sway or bounce as you drive, for a more comfortable ride. I hope you have enjoyed my reasons for choosing a Class A RV. Buying or renting an RV at first can be a difficult decision to make, there are so many choices to be made. Hopefully, I have made enough of a case to persuade you that Class A is the only way to go if you’re looking for comfort and luxury. A Class A RV may not be the best choice for everybody, you need to have the budget to buy one, after all. However, once you have experienced the style of a Class A RV, you won’t ever want to go back to any other form of travel. 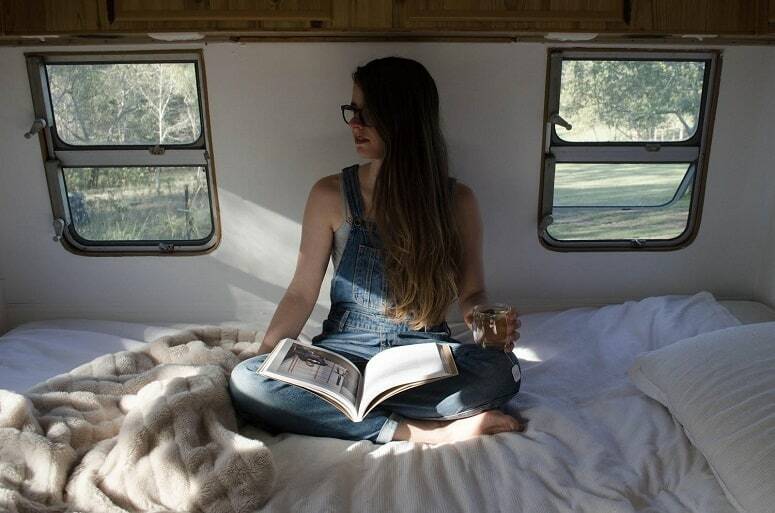 With a Class A RV, every day can feel like a rockstar lifestyle on the road. Even retired rock stars need somewhere to live! If you have any better reasons why you chose a Class A RV (and not a Class C), feel free to share them with us.